The weight room can be incredibly intimidating. Here's a beginner's guide to 5 popular machines. Let's face it: there are few things in this world more terrifying than walking into your gym's weight room. It's usually pretty scarce of female allies, it often wreaks of a not-so-appealing bro-stench (some mix of body spray and B.O. ), and (worst of all) it's filled to the brim with mysterious machines you have no idea how to use. 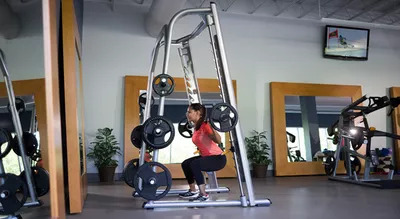 Sure, you could probably figure it out if you tried, but if you've never been trained to use the equipment at your gym, it can be incredibly intimidating. What if you accidentally sit backwards on the machine, totally embarrassing yourself? Or worse, what if you use too much weight and hurt yourself? These are genuine (and totally reasonable) fears. 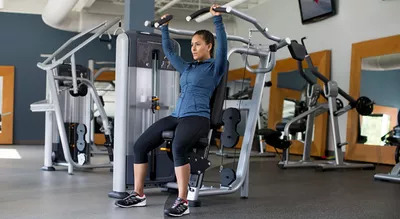 To help move past your gym-fright, Curtis Williams, Under Armour sponsored trainer and owner of Training Camp NYC, gave us a crash course in the top 5 pieces of weight-lifting at the gym. Stick to his tips and you’ll be master of the machines in no time. 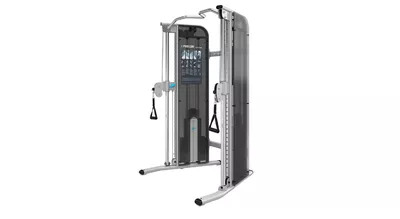 For all these machines, start with around 15 pounds on each side. Rather than increasing weight too quickly, focus on perfecting your form. When it comes to reps, if you're trying to build endurance, go for 15-20 and 1-4 sets. If you want to focus on strength, stick with the same number of sets, but 8-12 reps.
Start with no weight on both sides and focus on getting comfortable under the bar itself, with your hands supporting the bar on either side of your head. While you move through your reps, focus on good posture: keep your spine aligned and perpendicular to the floor. This machine should be your new go-to for strengthening your chest muscles. Plus, since you have to stabilize through your core the entire time—it doubles as a great ab workout, Williams says. Win, win! Stand between the two handles, grabbing one in each hand, arms wide. Your elbows should be slightly bent so there's no strain on your joints. Engage your core, and bend your knees slightly. Now bring your arms in, like you're trying to touch your fists to your chest. Hint: if your hips are moving, your core isn't engaged, you're using too much weight, or both. Make sure your motion is controlled in both direction—the weight shouldn't be so heavy that it yanks your arms back. 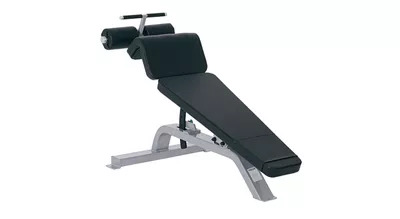 Williams recommends using this machine to strengthen your back because it's very versatile. With just a quick grip adjustment on the handles, you can transition between targeting your lower or upper back. Plus, it's a surefire way to fix your posture after spending long hours slumping over your phone or computer. Pick either the high-grip (making fists horizontal) or the close grip (with fists in a vertical position). The high-grip targets the upper back, with the close grip targeting the lower back. Pull each side individually, and alternate between left and right. That's one rep.
Make sure you stay balanced on both sides, and your posture is never compromised. 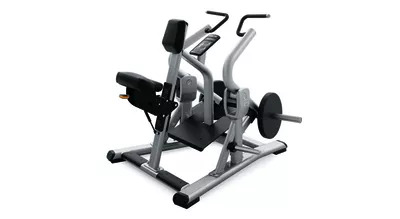 Find a comfortable, seated position on the machine (pictured). Make sure your elbows are level with earlobes. Grip the hand holds comfortably, and press up until your arms are fully extended. Bring your arms back down and make sure the movement is controlled. Climb onto the bench insert your legs into the padded areas on either side of the handles, hooking your legs on the padded rests and leaning back. Face your chin forward to protect the back of your neck. And use your core muscles to sit up with your hands across your chest. Start with a slight incline, and re-adjust the bench higher if that's too easy. For even more of a challenge, keep your elbows wide and hands behind your head.